The second game: the direction button is a bit wonky. 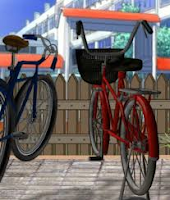 rotate the bike pictures for the up down clue for the closet. there is something inside the picture frame, behind the desk, and behind the poster. combine with clue you find in closet. check the picture frame twice. there is something on the side of each of the top two drawers. the ice pop gives a clue about how to use the time as code. Projector clue (pretty obscure): swap two letters. Apply the same swap to the RL clue. don't miss something by the ice box. Vivi - have you found paper with sissors on it? So guess you have to cut the otther papers the same way an you get 3 letters. I can't figure out R/L code. Tried all combinations but nothing - someone please? Anyone still playing? I am stuck with the ice pop stick which I am pretty sure is for re-ordering the numbers for the time but have been unsuccessful with that so far. Also have an umbrella which I have been poking around with but not finding a use for it. i hope the third story is better, cause this one was not so good. Why does Robamini cooperate with Rinnogogo? can someone explain the clock please... 5:45 to 50:54 not working neither is military time. reminded me a bit about the primera graphic, still who cares about rob/rin collaboration as long as game is good? i get 206 or 1106 on the colored papers but that doesn't work on box in closet. am i supposed to use the other paper with 223 on it somehow? hoping someone does a video walkthrough on this one.... really stuck. giving up for now.... hoping someone gives some more hints or posts a video walkthrough. @brin you need letters not numbers..
ok stuck, probably close to the end with a crowbar with teeny tiny suitcase attached, clues anyone?